Todros Geller (1889-1949) The Prophecy etching #18/25 10 x 8″ sight, pencil signed, p.o.r. Todros Geller Fiddler mitte fiddle Berle mitte bass… etching p.o.r. Todros Geller, born in Vinnitsa in the Ukraine in 1889, first studied art in Odessa, Russia, then in Montreal, where he immigrated in 1906. Seven years later he married and moved to Chicago, where he studied further at the School of the Art Institute (1918-23). According to Sparks, Geller took lessons from George Bellows. Bellows did indeed teach at the Art Institute School in the fall of 1919. Geller began exhibiting at the Art Institute in 1925. 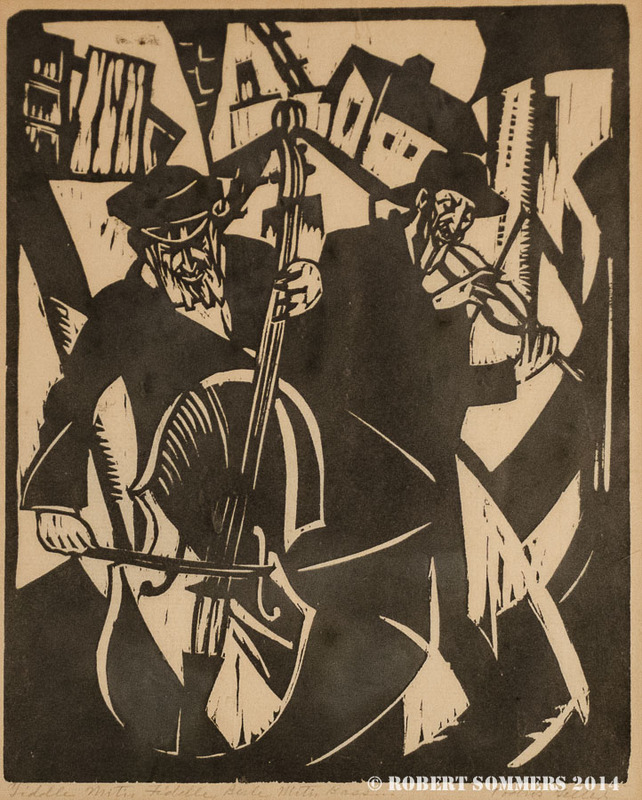 Two of his works were chosen to be illustrated in AIC annual exhibition catalogues: Jerusalem the Old (1929) and Reconciliation Dance (1930), and Geller exhibited his works there until his death in 1949. Geller joined the Chicago Society of Artists and served as president, eventually being named the “Dean of Chicago Jewish Artists.” In 1929 his painting Jerusalem the Old was illustrated in the catalogue of the Art Institute’s thirty-third annual exhibition; that year Geller had visited Palestine where he was inspired to paint biblical themes. He also created a woodcut series entitled Seven Palestinian Martyrs Cut on Wood. Chicago critic Bulliet believed the prints to be “in a modernistic vein, shorn of nonessentials but kept within the bounds of naturalism.” In the early 1930s Geller was teaching at the Midwest Art Students League. Geller took part in the outdoor Grant Park Art Fair just south of the Art Institute, in 1932, during the early years of the Great Depression. He was in the company of other great Chicago artists, including Aaron Bohrod, Julio DeDiego and Emil Armin. Also from 1932 comes a lithograph, Dreamer of the Ghetto, which features an introverted, if not demented man within an Expressionistic architectural setting. Geller was active in the Federal Art Project in Illinois, established in 1935, in the mural and graphics departments. As a participant in this program he studied Osage Indian life in Oklahoma and contributed paintings to William Wells High School (apparently the work there has been removed or destroyed). The Osage Museum in Pawhuska, Oklahoma has Geller’s works. Todros Geller signed the Call for the First American Artists Congress in 1936, which was a stand against fascism. Geller contributed to the Chicago Society of Artists’ first calendar in 1937. Two years later he exhibited at the Riverside Museum Exhibition, New York, as well as a wood engraving of New Mexico ruins at the New York World’s Fair. As one of America’s successful printmakers, Geller published A Volume of Sixty Woodcuts: From Land to Land. His engravings received awards at the Library of Congress National Print Exhibitions. 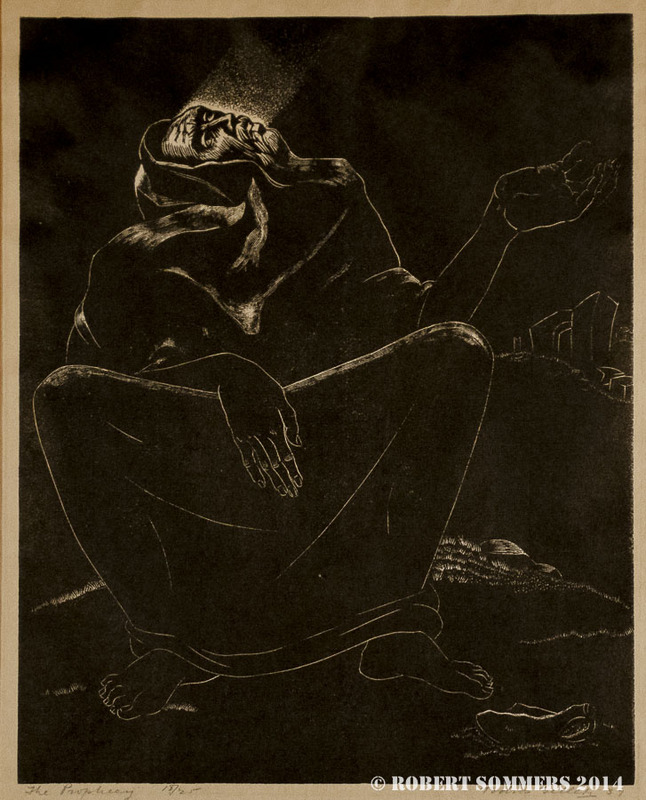 Geller’s print called The Prophet was exhibited at the Whitney Museum of American Art in 1941. He also designed stained glass windows in temples and synagogues throughout the United States and was called a leading authority on Jewish art. As a teacher, Geller gave art lessons at the Jewish People’s Institute in Chicago, at the College of Jewish Studies and at Hull House – one of his students was Mitchell Siporin. Geller was a member of the supervisory staff of the Board of Jewish Education, also in Chicago. In all, he was given five one-man shows, and when Geller passed away in 1949 the Board of Jewish Education and the American Jewish Arts Club sponsored a memorial exhibition. The Art Institute of Chicago owns Geller’s painting entitled Strange Worlds (1928). Here a severe older man with a beret looks at the viewer from under an “El” platform staircase, next to a newspaper stand with a collage-like assemblage of front pages. Behind is an urban scene that has rightly been called futuristic with blurred, cubistic forms in motion. Todros Geller Archives, Spertus Museum of Judaica, Chicago; Sparks, Esther. “A Biographical Dictionary of Painters and Sculptors in Illinois 1808-1945.” Diss., Northwestern University, 1971, p. 390; Yochim, Louise Dunn. Role and Impact: The Chicago Society of Artists. Chicago: 1979, pp. 28, 44, 238; Mavigliano, George J. and Richard A. Lawson. The Federal Art Project in Illinois 1935-1943. Carbondale: Southern Illinois University Press, 1990, p. 120; Dijkstra, Bram. American Expressionism: Art and Social Change 1920-1950. New York: Harry N. Abrams, Inc., 2003, p. 155. Chicago Modern 1893-1945: Pursuit of the New. Chicago: 2004, cat. no. 36. Written and submitted by Michael Preston Worley, Ph.D.